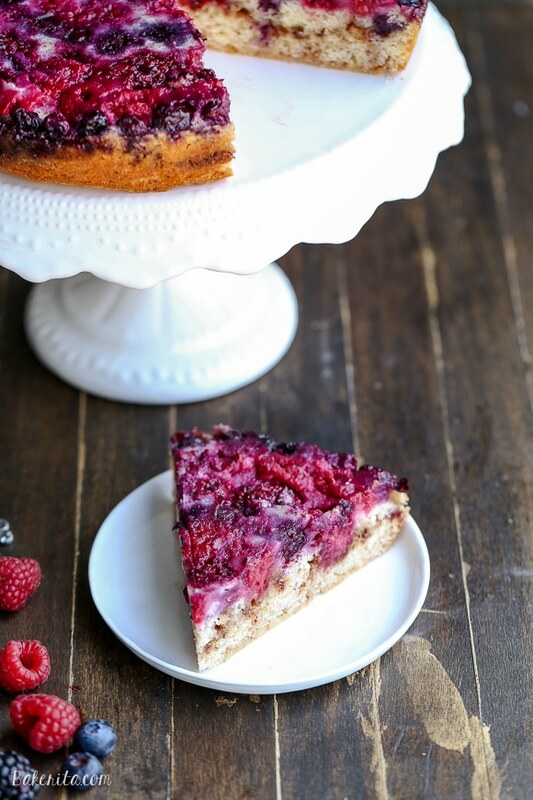 This Berry Upside Down Cake highlights the bright flavor of fresh berries and has a layer of cinnamon crumb swirl in the center! This post is sponsored by Krusteaz. Berries are back to being reasonably priced in the grocery stores, and it means I’m stocking up every single time I’m food shopping. I can never get enough of berries, and they’re one of my favorite ingredients to bake with – that’s why probably why I have a TON of berry recipes. The sweet, tart flavor of berries – particularly blackberries and raspberries – can brighten up any dish, and I knew they would really shine in an upside down cake. My friend Isadora from She Likes Food made a beautiful mixed berry upside down chocolate cake (hers is also gluten-free!) and I couldn’t get it out of my head! I took inspiration from her delicious-sounding cake to create my own berry upside down cake. 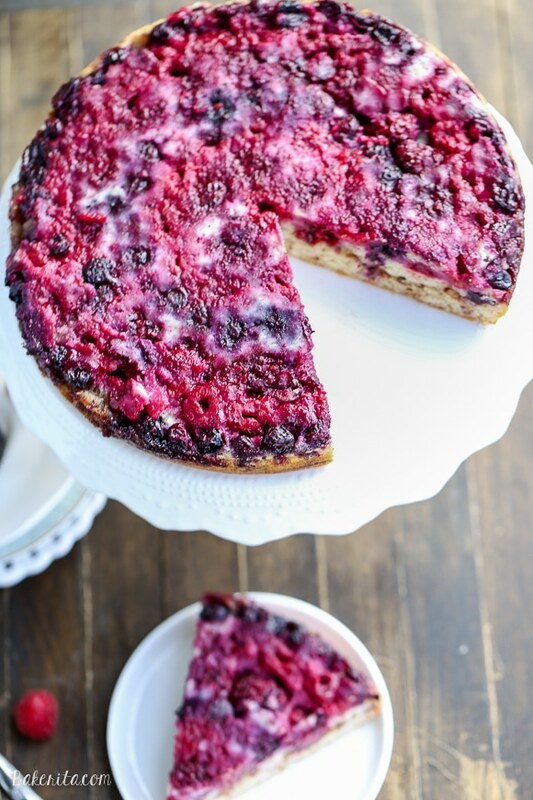 This is berry upside down cake would be the perfect addition to an Easter brunch, but it’s so easy that you can whip it up any day your craving something full of berry flavor. The cake is made with the help of Krusteaz Cinnamon Swirl Crumb Cake Mix, jazzed up a bit. I used Greek yogurt in the cake to help soften it up, add some moisture, and give a bit of that tangy flavor. Lemon zest also helps brighten up the cake batter, which is spread on top of the berries – I used a mix of raspberries, blackberries, and blueberries. Half of the batter is spread on top of the berries, and then comes a thick layer of cinnamon swirl crumb! The rest of the batter goes on top, and then it’s baked through until the berries are bubbly. I made this cake in a springform pan so it would be super easy to remove the sides, flip over, and then pry off the bottom of the pan, but if you don’t have one, a regular cake pan will do just fine. I’d recommend lining the pan with parchment to ensure your cake comes out of the pan cleanly. Find the complete instructions on Krusteaz website. This post is sponsored by Krusteaz. Thank you for supporting the brands that support Bakerita! What a pretty cake! I would love to have this for breakfast or dessert. I’m so glad that berries are coming into season now so that I can bake with them! It’s the best time of year! :) Thanks so much, Ashley. We’ve been buying fresh berries every chance we get, and my kids can’t get enough of them! I love all of the colorful berries you’ve added to this cake, and that cinnamon swirl looks like the perfect partner for those sweet berries! It’s so nice to buy berries again — I’ve been buying them up like no tomorrow lately because I’ve missed them so much! 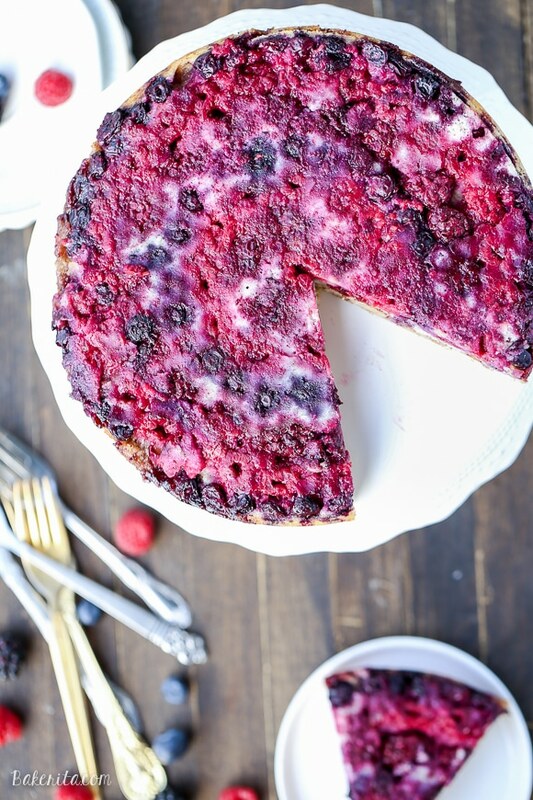 This cake is gorgeous and such a great way to use berries. What a great spring dessert! Wow! So colorful and amazing, it seems delicious! That color!! This cake just makes me happy! This is so beautiful and looks delicious, I love berries. I like the cinnamon crumb swirl, great addition! Take care. I love that cake!! I need to try your version next :D thanks, Izzy! Bring on the berry recipes! This cake looks delicious! This berry cake looks absolutely marvelous!! 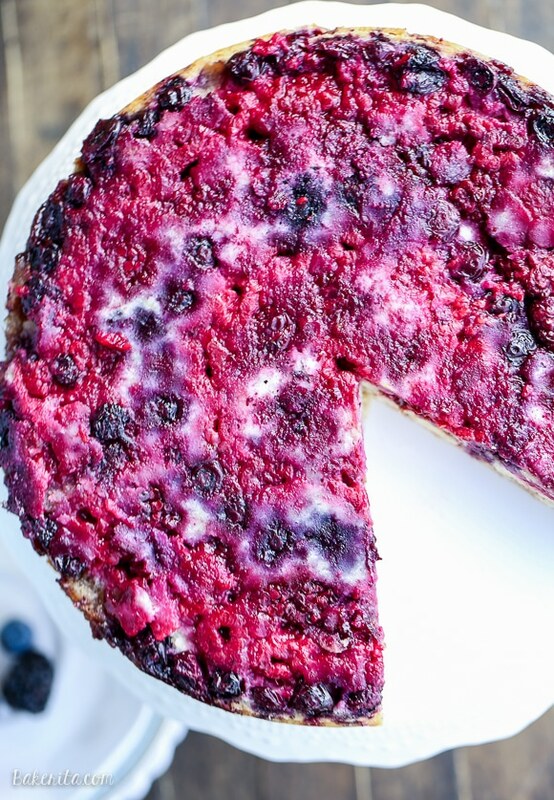 Never tried a berry cake, definitely going to try out this recipe tomorrow. This is gorgeous! Berries are reasonably priced where I live too, but they are tasteless :( I will buy some when they are in season, because this cake looks amazing! It’s the worst biting into a flavorless berry! You’ve got to try it when they get delicious again :) thanks, Cathleen! Woah! This cake is stunning! I just recently realized there’s a world outside of pineapple upside down cake ;) This berry version is phenomenal! I love love how you always turn Krusteaz products into epic desserts!! I want all the berries now after this cake. Hi! I would love to try the Lemon Mixed Berry snacks, but I can’t use coconut oil, or flour. Is there a suitable substitute? Could this be made with frozen berries? Thanks!